When I tweeted that I was going to Hatfield's for the first time ever, @twohatfields responded back: "@kevin_Eats @mylastbite FIRST TIME? Where have you guys been?" Indeed. Hatfield's was one of those restaurants that I'd wanted to try for seemingly forever, but, for some reason or another, just never got around to. Given that the restaurant would be serving its last meal on August 8th, before reopening in another location in November, I felt it fitting and felicitous to finally fare here on its penultimate night of service. Joining me were Mike of Right Way to Eat, Sook of Yutjangsah, and Sook's friend Lisa. The story of Hatfield's begins years ago, when Karen and Quinn Hatfield first met while employed at Spago. The pair worked at a number of restaurants around the country before landing at Cortez in San Francisco in 2003. After cooking there for a few years, the duo moved back to Los Angeles to open Hatfield's in 2006, taking over the space of a former Chinese restaurant down the street from Angelini Osteria and Grace. 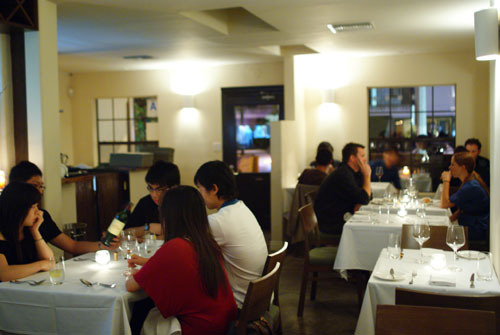 The restaurant has consistently been ranked among the City's best, even garnering a Michelin star in 2008. 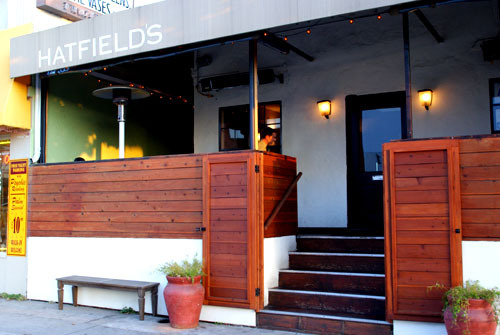 But with success came a desire to expand, and in May 2009, the Hatfields confirmed that they were moving to a new location at 6703 Melrose at Citrus, the site formerly occupied by Tim and Liza Goodell's pan-Asian eatery Red Pearl Kitchen, and before that, the Goodell's small plates concept Meson G. Go back even further, and you'll find that the space was Alex Scrimgeour's Alex, and prior, home to Michel Richard's legendary restaurant Citrus. This new locale places Hatfield's a stone's throw away from Osteria and Pizzeria Mozza, and a half mile from Providence. As for the old Beverly site, Mark Gold, former Executive Chef at Leatherby's Cafe Rouge, plans to transform it into Eva restaurant. 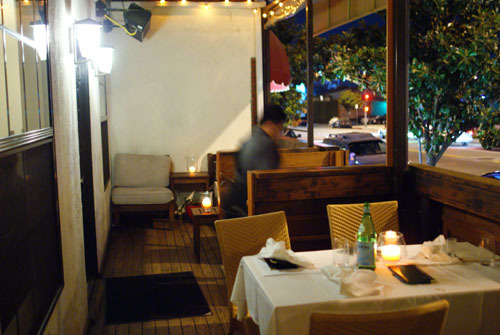 Hatfield's is a smallish restaurant, seating around 50 patrons in both indoor and outdoor settings. Inside, the decor is spare, with its barren white walls, yet intimate. Things are a bit more rustic outside on the wrap-around terrace, where you get a good dose of the hustle and bustle of busy Beverly Boulevard. For photographers like myself however, lighting left much to be desired; at ISO 800, wide open at f/1.8, shutter speeds were in the 1/8s range, and as a result, my photos turned out marginal at best. Quinn helms the kitchen while Karen creates the desserts and runs the front of the house. 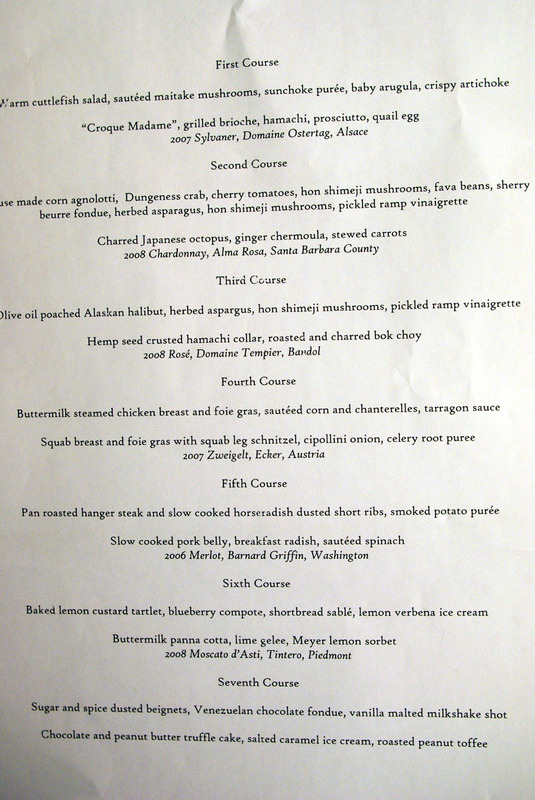 À la carte selections are always a option, but obviously we went for the seven-course tandem tasting menu [$85], with included wine pairings [$44]. Click for a larger version. 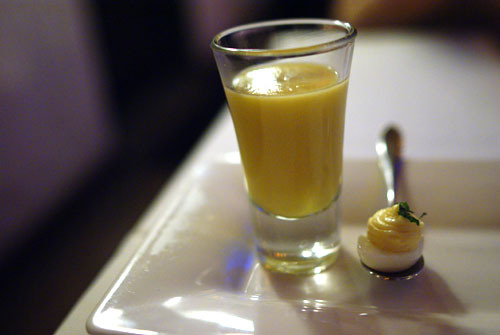 To begin, we were served an amuse bouche of sweet corn soup, deviled quail egg, and smoked trout. I first tried the soup on its own, and it was intensely sweet, a bit too much so for me in fact. I then tasted the egg, and absolutely adored its smoky/creamy flavor and briny aftertaste. I then finished up the corn soup, and it was then, paired with the egg, that the soup finally made sense. Only a singular type of bread was offered, but we were all raving about it, quickly devouring our first servings. The bread reminded me of Gruyère gougères in terms of flavor, though the cheese in this case was actually Emmental, another Swiss variety. 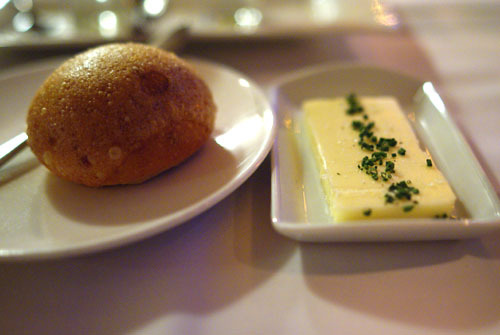 Butter was mild, yet slightly sweet, and came topped with chive and salt. We started the meal proper with a lovely cuttlefish salad. 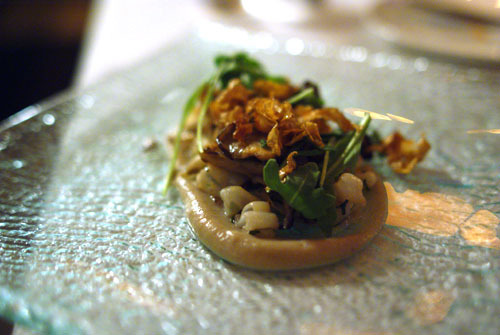 I really appreciated the gravity and richness provided by the maitake (hen of the woods) mushroom, and how it accompanied the mild sweetness of the sunchoke, with the bitterness of the arugula adding a great accent. Flavor-wise, the artichoke didn't do much for me, though it did contribute a crunchy textural element. Ironically, the cuttlefish itself could've been a bit more apparent. Traditionally, a croque madame is a grilled ham and cheese sandwich (a croque monsieur) topped with an egg. 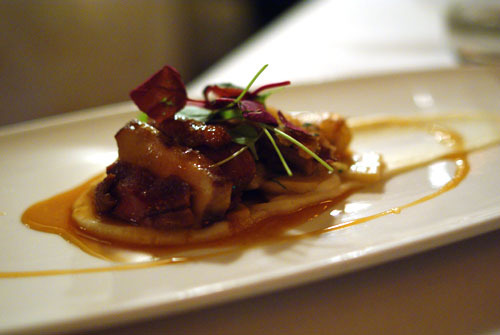 Hatfield's' version adds hamachi and substitutes prosciutto for mere ham to create the restaurant's signature dish. For me, the delicate yellowtail was a base for the rest of the ingredients. The toasted brioche added weight and unctuousness to an otherwise light, mild fish, while the prosciutto contributed a marked salty component, and the egg a rich creaminess. 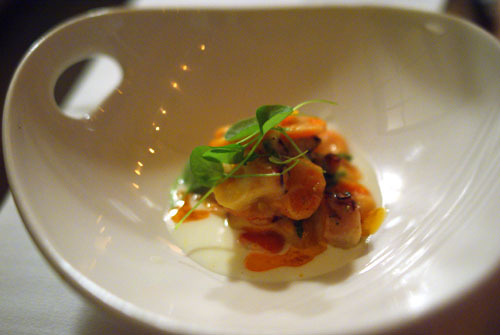 All the various components worked in unison beautifully, making the dish my favorite of the night. Agnolotti are basically small ravioli, and tasting this dish, I first noted a notably tart attack, leading to the sweet richness of the corn, which was then accented by the tang of the cherry tomatoes. The hon shimejis, meanwhile, added weight and a great crunch. I would've liked the sweet brininess of the crab to have been stronger though, and the fava beans weren't all that apparent either. I really enjoyed the octopus here, which was simultaneously sweet, smoky, with a bit of brine on the finish, reminiscent of the octopus I had recently at Angelini Osteria actually. The cephalopod was deftly balanced by the vegetal carrot and sweetly pungent ginger chermoula (a type of marinade oft used in North African cookery). Very nice. 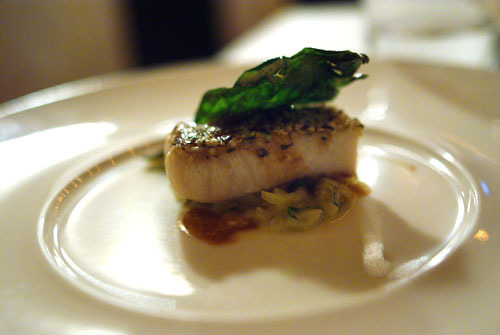 This was really a quintessential example halibut: lean, clean, delicate, with a firm, flaky consistency. 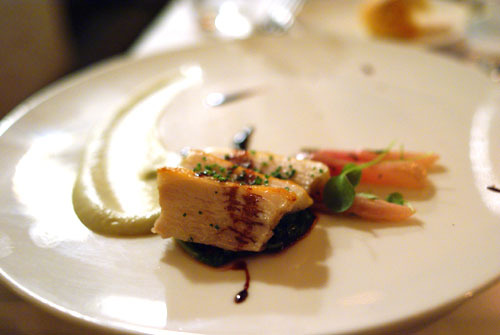 The fish was tasty enough on its own, but the use of asparagus gave the dish a great vegetal counterpoint, while the ramps provided a lovely, onion-y sapor. Vis-à-vis the halibut, the yellowtail couldn't have been more different--it was a richer, fattier fish with a much finer, tenderer texture. Here, I appreciated its bold flavor and how it was offset by its lovely, peppery hempseed crust, while the bok choy gave the hamachi a nice vegetal finish. Thanks to the use of buttermilk, the breast here was one of the best preparations of chicken I'd had in a while--incredibly tender, moist, and flavorful. The foie gras, on the other hand, was a bit too sweet for my tastes, though I did appreciate its texture and how it was tempered by the bracing smack of peas and tarragon. I quite liked the squab here, as it was immensely flavorful, heightened by the sweet cipollini, and softened by the celeriac purée. Interestingly, the bird was actually much more strongly flavored than the foie, and eating the two together, I noted the liver only on the finish. Here we have a duo of beef: steak on the left, short rib on the right. I first tasted the short rib, which was tender as expected, but still possessing a bit of bite. Flavor-wise, the rib was robust, but not overwhelming, and I liked the use of horseradish and potato in tempering the beef's potency. Next up was the hanger steak, which I found quite flavorful, yet surprisingly tender for the cut; it was even better when taken with the included onion. The pork belly was one of the standouts of the meal for me, and one of the strongest preparations of pork belly I've had in recent memory. 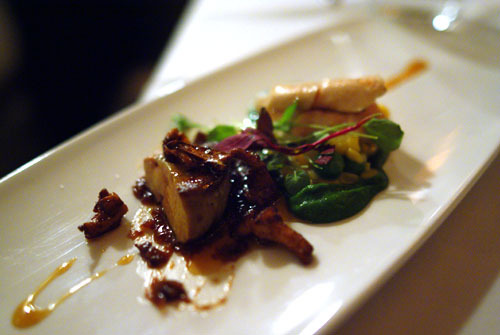 The pork was comprised of a good ratio of fat and flesh, making it notably decadent, but not overpowering. It was delicious on its own, but fantastic when mitigated by the vegetal, bitter spinach and subtly sweet, crisp radish. 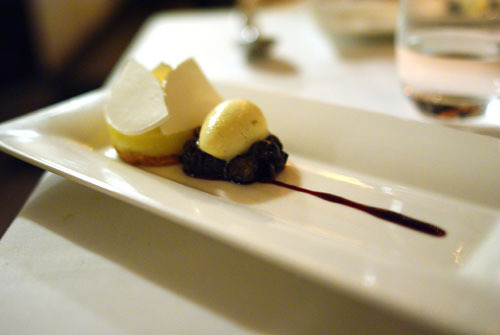 Now moving on to the first dessert, the key here was the interplay between the sourness of the custard and ice cream and the sugary sweetness of the blueberry compote. Texture-wise, I also enjoyed the light, ethereal meringue topping and the use of a crumbly sablé cookie crust. Here, we had a similar interaction of sweet and sour components. The dominant player in this case was the strawberry, which was foiled by the tart lemon sorbet, and both elements were tempered by the relatively mild, creamy panna cotta. 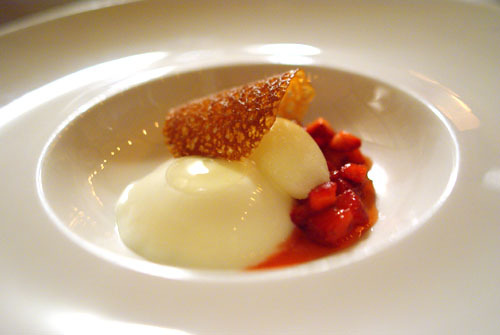 The tuile, meanwhile, gave the dessert a much-needed crunch. I've never met a doughnut I didn't like, and this was no exception to the rule. 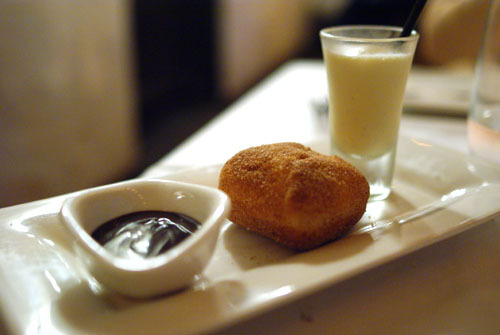 I loved the beignet by itself, with its rich, friend dough complemented by alternating flavors of sugar and spice. The chocolate fondue, meanwhile, added a further layer of luxuriousness to the dessert. The best part, though, was the milkshake, a perfect amalgam of vanilla and malt--I wanted a whole cup of it! Susie seemed to agree with me, and she unceremoniously downed nearly the entire shot, not leaving much for Lisa. But not to worry, we actually ordered an extra serving of this dessert! This dessert did not bode well for me, given that I have a strong disinclination to peanut butter. And in fact, eating the truffle cake by itself was not particularly pleasant. However, everything else on the plate was superb. The salted caramel ice cream was especially tasty, and I loved the crunch of the peanut toffee. Eating everything together did temper the peanut butter, making for an overall enjoyable experience. On explaining the move, Karen stated that they "wanted to expand to a larger space and take Hatfield's to the next level, with a larger restaurant, larger menu, lunch and dinner, seven days. We were trying to find ourselves a home for the next 20 years." While I understand this rationale, I sincerely hope that the Hatfields can translate the current restaurant's honest, intimate feel and top-notch cooking to a larger venue (the new space doubles capacity to around 100). In any case, I wish the Hatfields the best of luck, and look forward to visiting the restaurant in its new digs. I can finally see why so many people rave about the place--Hatfield's is the real McCoy. oh yes, i remember the hanger steak + short ribs. yum!!!! Good to share the meal with you Kevin! Great job with the review as I now need to step it up over Sook. Hehehe. We ordered an extra Croque... it was just perfection. I'm so glad I got to eat there before the move! piggy backing on what pepsi monster said... I had almost the same exact dishes a year ago, almost to the day... I hope they change the menu in the move! I was thoroughly impressed by my meal here. I wish them the best on their new spot. It's a good thing they're moving since their kitchen at the current space is minuscule. I shed a tear for never having gone. Peanut butter is such a love it or hate it spread, heh? As a peanut butter lover, I must say I loved the truffle cake! Great review. Good photos, great desciptions. Just the right size - readable in one seating. I can't wait to try it. Do you happened to know what kind of butter they use? Since they put salt on top, are those Echire/Lescure Butter, Beurre de Baratte, or they are just some regular unsalted Land-O-Lake? I actually laughed out loud. Nice review. I went probably 6-7 times at this location and thoroughly enjoyed myself. Hanger steak is one of the most tender cuts of beef next to tenderloin...in fact hanger is actually called a hanging tender. Are the cheese Emmental AOC certified? What kind is it - Classic, Organic, Reserve or Cave-aged? What kind of Prosciutto do they use for the "signature dish"? Procsiutto Di Langhirano, Procsiutto Di Parma, Procsiutto San Daniele, Domestic Daniele Procsiutto or something else? I'm so bummed! I always wanted to eat there too and now I miss it. I need to read your blog much more often. Jin: Which did you prefer? Mike: I'm a little woried that you remember all the dishes! Sook doesn't have hers up yet though, so you still have a chance. Charlie: Indeed. I'm probably going to come back after the move, so I really hope I won't be served the same thing. Matt: Agreed. I just hope they don't try to do too much in the new spot. Weezermonkey: Why didn't you go? Cathy: Ugh, definitely a "hate it" from, even though I like peanuts, interestingly. sygyzy: Thanks. For the sake of time, I pared down some of the descriptions here. Dason: Nope, unfortunately I don't know exactly what kind of butter was used. I would hope that it's a step above Land-O-Lakes though! His Dudeness: Thank you--I'm glad at least someone got the reference! 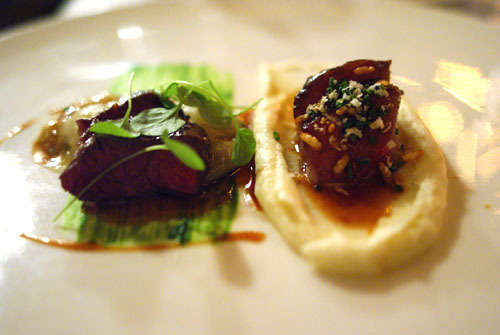 Anonymous: The hanger steak can be quite tender if done properly, but I've had more cases in which the meat was a bit tough (but certainly edible). Dason: Sorry, I don't have the details for the Emmental or Prosciutto. Larry: Don't worry, you can always come back in a few months. I'm sure it'll be much of the same as before. I know I'm a month late on this post... but I really do wish they don't lose their charm after they move to their new space. 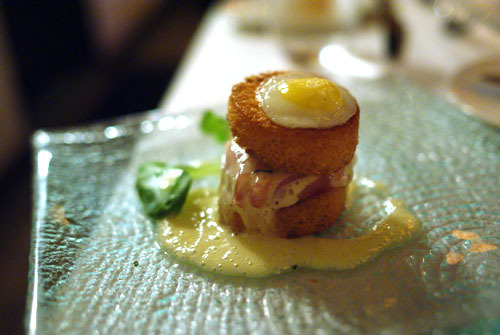 The croque madame was my favorite out of their tasting menu as well... delicious! Any plans to visit Eva Restaurant, their replacement? I didn't even know the name of their replacement! Do you know any details? Chef? Owner? Cuisine? I'd definitely love to check it out just to see what they did with the space. 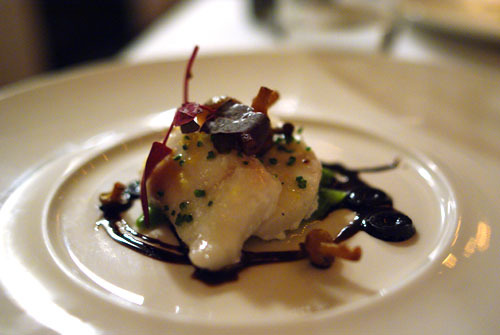 The chef is Mark Gold, most recently the exec chef of Leatherby's Cafe Rouge, and before that, Cafe Pinot. 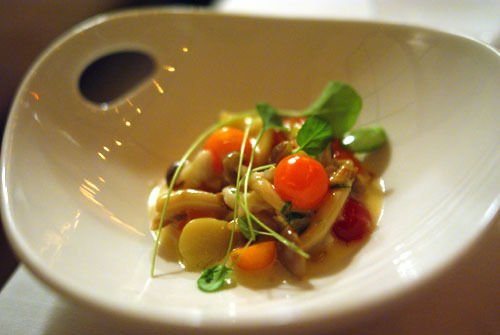 The menu is comprised of reasonably-priced, market-driven modern American fare. I understand that Hatfields will be reopening on Feb. 1st. Any scoop on how the new restaurant looks, etc.? My husband and I miss our every other month trek from Manhattan Beach to get our Hatfield's fix! Yep, February 1st is the latest date I have too. As far as looks, I've only seen what's been on Eater LA. I can't wait! Is hatfield's reopening w/ the same owners/chefs? Gordon, I'm pretty sure that they are. I believe the only thing that's really changing is the location. I already have my reservation for 2/1, so I'm about to find out. Nice running into you the other night! How was the meal? That last dessert sounded unbelievable. I loved every word in the title of the dish. 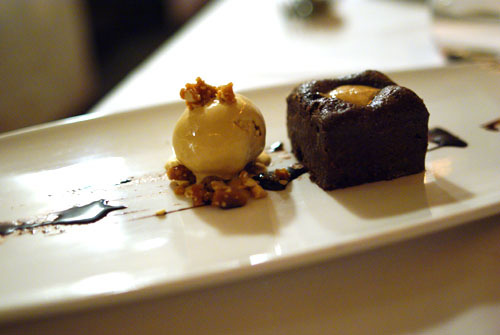 Chocolate, truffle, cake, salted caramel, ice cream, roasted peanut toffee--all good. Not sure about the peanut butter though!